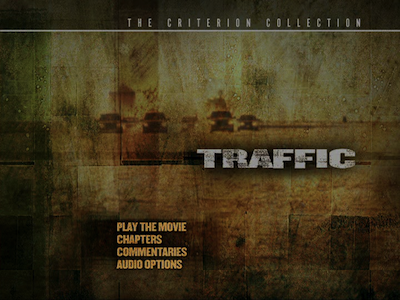 It's hard to believe it's been ten years since Steven Soderbergh's Traffic landed in cinemas. Because not only is it still the gold standard in terms of complex, multi-layered Hollywood storytelling--perhaps rivaled only now by the director's more recent Contagion [review]--but it still feels depressingly relevant. Characters in this film, which tracks the movements of drug smugglers on opposite sides of the Mexican/U.S. border and the people who try to halt them, regularly point out that the war on drugs is a pointless endeavor, and there seems to be little that has happened in the last decade to refute this. In fact, the border clashes between the Mexican cartels are worse than ever. The only thing Traffic didn't predict was the upsurge of crystal meth. Traffic is essentially three different intersecting stories. 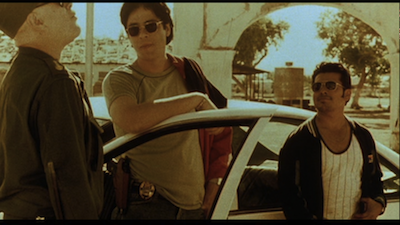 In Mexico, a principled police officer named Javier (Benicio Del Toro) becomes involved in his country's push against the Tijuana cartels. He is recruited by General Arturo Salazar (Tomas Milian), a tough enforcer whose methods are not always on the up-and-up. 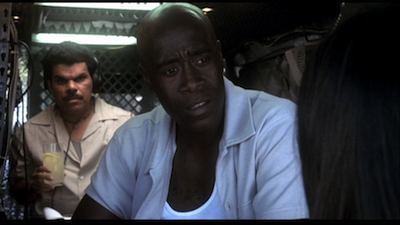 Across the border, two DEA agents, Ray and Montel (the magnetic, hilarious tag team of Luis Guzman and Don Cheadle) bust a mid-level smuggler (Miguel Ferrer), which leads to the arrest of the man up above him, a fellow named David Ayala (Alec Roberts). David's wife Helena (Catherine Zeta-Jones) is six months pregnant and left to take care of their other young son on her own. She was unaware of her husband's side business, but she gets acquainted fast. Away from this frontline combat, Judge Robert Wakefield (Michael Douglas) is leaving Cincinnati for Washington D.C. to take over the mantle of drug czar. Wakefield is a well-meaning crusader who has no idea that, back at home, a much more personal drama than he has ever imagined is playing itself out. His teenage daughter Caroline (Erika Christensen) is developing a drug habit with her prep school friends and is on a collision course with tragedy. All of these stories are connected to one another, but the canvas here is so vast, very few of the characters directly interact. 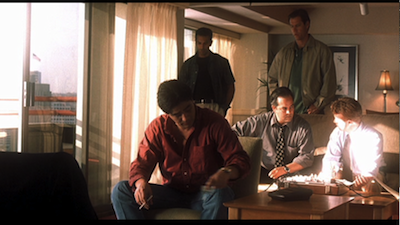 Javier never talks to Helena, and neither they nor the agents watching the Ayala family ever shake hands with Robert Wakefield. Screenwriter Steven Gaghan (Syriana ) avoids the obvious dramatic flourishes that could have made Traffic a far more slick commercial property, instead trusting the material and the audience to show that, in real life, small players generally remain on their own playground and the big operators very rarely come down to meet them. Gaghan and Soderbergh are actually adapting a lengthy BBC miniseries, Traffik (1989), which looked at the opium pipeline between England and the Middle East, examining the way all the pieces of this international puzzle fell together and the individual lives that were touched. The American filmmakers see little reason to mess with this basic tenet, and instead focus the narrative to even more precise story points. Each element works unto its own accord, though the reverberations of individual actions contribute to a larger effect. There are small victories, hollow achievements, and arguably, real failings. The irony is that for all the movements the select characters make, very little changes on the larger stage. Editor Stephen Mirrione, who is a bit of an expert at puzzle-films (his other credits include Go , 21 Grams , and 13 Conversations About One Thing ), clearly arranges the scenes so they lock together nicely, with smooth transitions that never leave the audience behind no matter where the material is due to turn next. This is all done not just with a craftsman's eye for detail, but with an artistic exuberance that is surprising for such a sobering subject. Traffic may appear to be dressed in mainstream clothes, but Soderbergh employs plenty of tricks he picked up in the art house, as well. 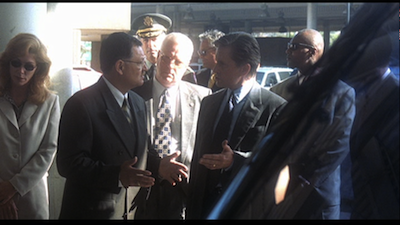 The storytelling has elements of cinema verité, with an almost fetish-like attention to documentary details (the party scenes in Washington even feature real politicians delivering their pet talking points). Soderbergh, who by this point was shooting his own movies under the pseudonym Peter Andrews, likes to get in close and move around, taking the proverbial fly-on-the-wall/bird's-eye-view to peer on each moment from a variety of angles. He also develops a specific approach for each of the three story lines: Mexico is overheated and yellow, Cincinnati is a chilled blue, and California is the sun-kissed center. This style never feels like grandstanding, nor is it intrusive; rather, the aesthetic blends together with ease, adding further to keeping the viewer oriented as to where and when they are in the tale. The cast of the movie is just as finely tuned as the rest of it. Soderbergh has assembled a remarkable ensemble, and all the performers do some of their finest work. In addition to the names mentioned above, bit roles are also filled out by Dennis Quaid, Salma Hayek, Benjamin Bratt, Albert Finney, James Brolin, and Amy Irving. Benicio Del Toro got most of the attention for his sensitive portrayal of a quiet cop trying to do the right thing, but really, Traffic belongs to the whole team. No one cast member takes off toward the stratosphere or takes attention away from the others. Only Topher Grace (That '70s Show ) gets close to overdoing it, but I have softened on that opinion over the years. I guess it's old age, since his obnoxious know-it-all turn as Caroline's privileged boyfriend now seems right on the money. Kids today, I tell you! Traffic pulled off the neat trick of both being a big-budget box-office success and genuine Oscar bait. Soderbergh, Gaghan, Mirrione, and Del Toro all took home statues on Academy Awards night, proving entertainment need not be dumbed down to appeal to the masses nor overly stuffy to court critical acclaim. Instead, Traffic is in a perfect middle, being simultaneously exciting to watch and informative. Its technique is both artfully considered and entirely natural, making for a movie its admirers will want to revisit again and again. For a complete rundown on the special features, read the full review at DVD Talk. Please Note: The screengrabs used here are from the standard-definition DVD released in 2002, not from the Blu-Ray.